Claire Fuller didn’t start writing until she was forty, beginning with short stories and flash fiction. Her work has been published in Litro, The Vintage Script and From the Depths. Her short story Baker, Emily and Me was a winner of the BBC Opening Lines Competition in 2014. Previously she trained as a sculptor and spent many years working in marketing. It’s been such a long wait – I was counting down the months and then the weeks, and the days and then finally it was here. It’s very exciting, and a little surreal. Not yet. I’ve been waiting to see if anyone spots the one big clue about what happens at the end of the novel, but I’m yet to come across anyone who’s found it. Maybe I’ll have to give the first person who mentions it to me (in private) a prize! At the beginning of the novel, you need your main character, Peggy, to be old enough to make the journey through the Bavarian countryside on foot, yet young enough to be taken in by her father’s fantasy. Did you have to do play around with her age to make things fit, or did this arise naturally? I did play around with Peggy’s age – she was nine for most of the time I was writing – but became eight later, not just because of that fine line between physical endurance and trustfulness, but because I needed Peggy to be seventeen when she is relating the story. But then eight became a bit of motif: Peggy’s parents have eight years between their ages, there are eighty-eight keys on a piano keyboard, Peggy’s brother is eight years and eight months old. Our Endless Numbered Days is about survival in extremity. Did this require a lot of research or were you already a survivalist at heart? It did take a lot of research, or certainly a lot of thinking, but I do like the idea of disappearing into the woods and managing to survive through my own resourcefulness. Not that I’ve ever actually done it. I loved your depiction of Peggy’s difficulty adapting to the ordinary world on her return, especially how she is overwhelmed by the array of choice in her mother’s house. How easily did you find it to get inside this mindset? I found that very easy. I think generally we in the West have too many things which we don’t need. I don’t like that we see the objects we own – the clothes, the technology – as being easily disposable even when they haven’t worn out, and that we take no responsibility for these things once we’ve thrown them away. Peggy’s father, James, is moody and irresponsible and, presumably, mentally ill. Should readers feel sympathetic towards him? I have some sympathy for James, certainly in the first half of the novel, and I’d hope that readers do too. He loves his wife and his daughter, but he acts rashly and then can’t go back on his actions. I think he is mentally ill, but that still doesn’t excuse all of his actions. Our Endless Numbered Days contains some beautiful descriptions of the natural world. Is this something that resonates for you personally? Yes, absolutely. I’m much more of a country person than a city person. And I love all writing – fiction and non-fiction – with descriptions of landscape. I enjoyed the ending and, although I didn’t anticipate it, it provided a satisfactory resolution to some of the things I’d been wondering about. How soon in your writing process did this ending come to mind? I knew when I started writing that Peggy makes it home – and the reader also knows it from the beginning. However I didn’t know the impetus that gets her there until I actually wrote the words on the page. What did you most enjoy about writing Our Endless Numbered Days and what did you find most challenging? I really enjoyed laying in the clues about what happens at the end. Most challenging was almost the same thing – working out how much I could say about the forest chapters, when Peggy is back home in London. That took a lot of tweaking. Luckily for me, it was picked up off an agent’s ‘slush pile’. I sent it out to twelve agents, and a couple asked to see a full submission, and then I went to a meeting with one of them and signed with them. I worked through some edits with my agent and she submitted the novel to a number of editors at publishing houses, and I was very lucky to get three offers. It then went to an auction which Fig Tree / Penguin won. Writers are often beset with a range of different creative ideas. How did you know that Our Endless Numbered Days was the one you wanted to run with? 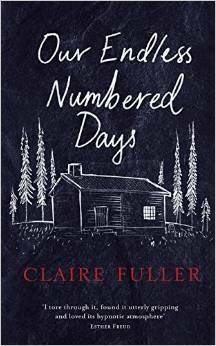 Our Endless Numbered Days is the first proper novel I wrote, and it was an idea that grabbed me. I do have lots of other ideas but these are channelled into short stories and pieces of flash fiction. I write something every day but I’m very definitely a pantster. I never know where a piece of writing is going until I’ve got there. That can be exciting – leading to some surprises I never could have planned, but it also very nerve-racking. I am always thinking ‘I can’t do this, I don’t know where it’s going’, but then somehow it gets there. Read, read and read some more. Often my best ideas for my own writing come when I’m reading someone else’s book (not the same ideas though!). I’ve written the first draft of my second novel, so I’m working on that, as well as the weekly flash fiction and short stories. I don’t think so – they were great questions.